Another holiday at Disney World…and I didn’t even intend to spend Memorial Day at Disney World! Sometimes there is Disney magic in the works and you don’t even know it! We had originally planned to go in April to Disney World but due to the snowstorm in New York City pushing my trip to the Big Apple back to April I had to push Disney back to May and ironically the only date I could make work was the last day of the Epcot Flower and Garden Festival….and Memorial Day!! Our day started off at Disney’s Animal Kingdom at 8 am!! I absolutely love the jam session that the Animal Kingdom has before the gates open! Disney knows how to welcome you into the parks that’s for sure!! We headed straight for Pandora to try to get on Flight of Passage but by the time we got there, it was a 90-minute wait. So we explored the Valley of Mo’ara floating mountains, played in the drum circle and checked out the new merchandise inside Windtraders (Full Pandora Review Coming Soon) before heading to Kilimanjaro Safaris. By the way, first thing in the morning is by far the best time to ride this attraction. There were more animals out and about since it was feeding time for most. Funny enough I said before we got on the ride that I was just going to enjoy it considering how many pics I’ve taken on this ride before…but it is impossible not to take pics on this amazing safari ride!! This was the first time we saw these color markings on the backs of the crocodiles. Does anyone know what this meant?! If you do please let us know in the comments below!! I’m very curious. After exiting the safari we walked through the Gorilla exhibit. The Gorillas are one of my favorite things to see in the Animal Kingdom and there were so many out! Can you count all three?? By 10am we were on the buses to Epcot…after all the Flower and Garden Festival was the whole point of this trip. I couldn’t miss our third year in a row at this event, and having to see my twitter feed full of delicious eats and stunning topiaries was just too enticing to miss. The Sugar Cane Shrimp from La Isla Fresca was delicious. It was supposed to be on a skewer but they were out…that didn’t matter much to me. The shrimp was huge and it came with steamed rice and a coconut-lime sauce. I typically don’t like the flavoring of coconut but it wasn’t overwhelming in this sauce and this dish turned out to be my favorite at this year’s Flower and Garden Festival. It was a close second to the Toasted Pretzel Bread from the Bauernmarkt: Farmer’s Market in the Germany Pavilion. It looks small for $5 but it was a tasty treat while watching the Groovin’ Alps perform. This percussion group was amazing to watch! Very funny and entertaining and had everyone dancing and singing in German along with them!! and also some cute hidden Mickey’s, and even Minnie’s! 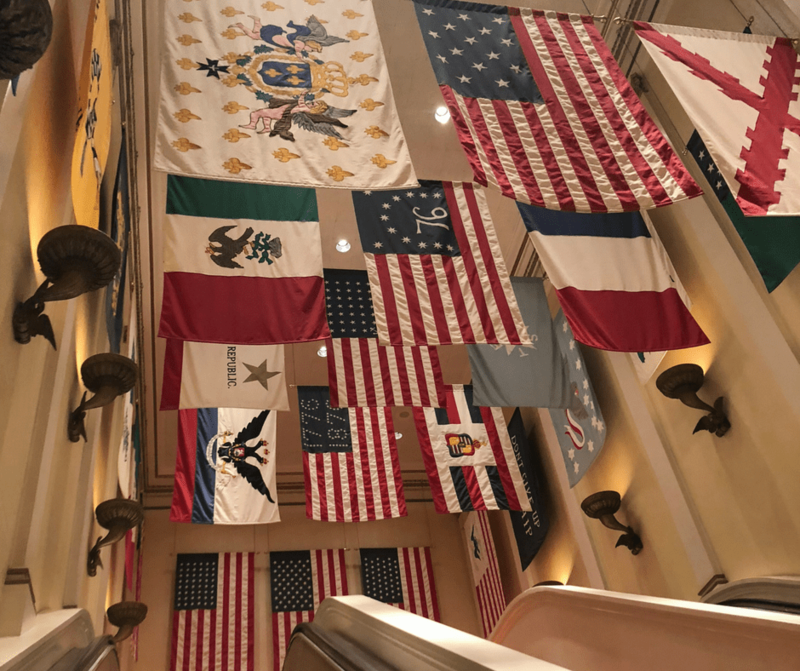 We made sure to explore the American Pavilion, it being Memorial Day and all, and checked out the American Adventure attraction for the first time as well! This 30-minute show features incredible animatronics of Mark Twain and Ben Franklin exploring the history and future of America, as well as singing and a slideshow that is touching to see. How about while we were in the American Adventure it rained…the only time it rained our entire trip and we were inside the American adventure attraction!! Talk about lucky! We also took our time browsing through the Morocco Pavilion and the Chinese pavilion which somehow we’d missed before. Epcot is huge and I always feel like I need 2 days there to accomplish everything I want to do. I knew this trip was short so I made it a day of fun firsts! After an incredibly hot day at Epcot, we took a nap before heading over to the Magic Kingdom for the Happily Ever After Fireworks. Taking a nap is a must do for a hot park day. In Spring or Fall I might skimp on this but for the most part, I’m a chic that needs a recharge on a long park day. Ending the day at the Magic Kingdom with the Happily Ever After Fireworks is just about as magical as it can get. I do miss the Wishes Nighttime Spectacular but it just doesn’t compare with the projections of Happily Ever After. After the fireworks, there were was an hour or so left enjoy the Magic Kingdom so we headed to Tomorrowland for the Incredible Tomorrowland Expo part of the Incredible Summer at Walt Disney World!! We were super lucky to get to see this Expo seeing as how it started 2 days before we arrived! There were many more things to explore in the Incredible Expo…other photo opts, a dance party on the Plaza Stage. a Jack-Jack Diaper Dash every day at 12pm…which I’m curious about! It sounds hilarious! There was also Incredibles Merchandise everywhere…and other Incredibles themed goodies! Be sure to look inside your Times Guide at the Magic Kingdom, or open the My Disney Experience App while inside Tomorrowland for all the deets. it was my first time riding at night and I loved it even more! People don’t give this attraction enough credit! We also squeezed in Mickey’s PhilharMagic and Peter Pan’s Flight. I was sad not to get to ride Haunted Mansion…but that’s what my Halloween trip is for!! We have a little tradition as we leave the Magic Kingdom that we’ve started. We either get a hot dog, corn dog, or corn dog nuggets from Casey’s Corner. Another thing we didn’t plan to happen…but we are always hungry leaving the Magic Kingdom and Casey’s Corner is always open until the very end. This time we got the Corn Dog Nuggets and french fries. I truly love their fries. They’re my favorite of all the fries at Disney World. As we piddle-paddled our way out of the park we checked out the NEW! Americana Mickey Mouse Collection of merchandise. It’s Red, White and Blue…and some say Laugh, Love, Mickey which is adorable!! It was another Disney holiday for the books! We had an absolute blast celebrating Memorial Day at Disney World!